This adventurous old school classic is half two-star crack climbing and half four-star slab climbing. This is a semi-serious route. While you?re not usually looking at a dangerous fall, there is some big sliding potential and some of the cracks are flared and difficult to protect. Both the leader and follower should be confident 5.8 friction climbers. 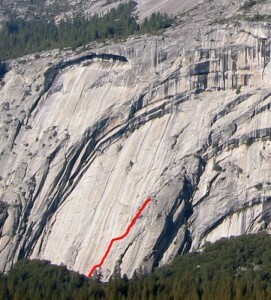 60-meter ropes are mandatory. Which SuperTopo guidebooks include a topo for Arches Terrace?